OMEGA’s Aquarella collection of watches for ladies adds a bold feminine touch to a classic watchmaking design, sumptuously decorated with diamonds and a choice of ten different precious stones covering the entire “gemstone rainbow”. The striking stainless-steel case of the OMEGA Aquarella collection, based on an original OMEGA design from the 1930s, is fully paved with diamonds on the lugs and bezel. 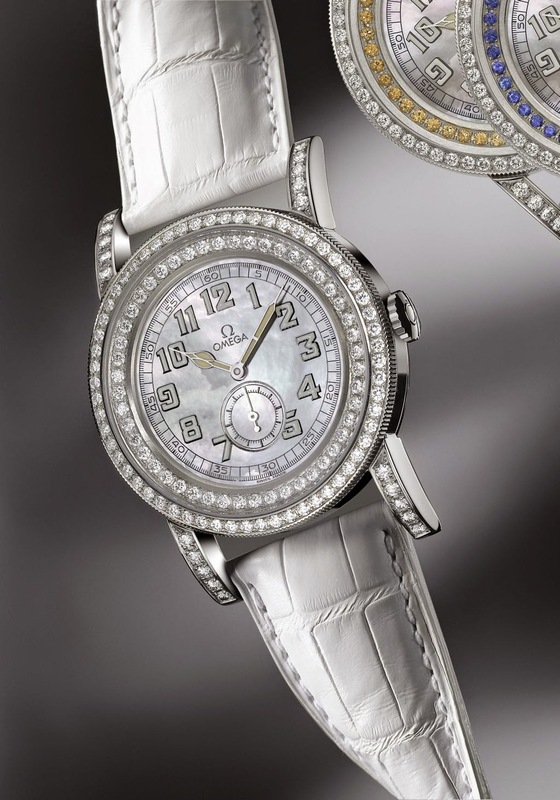 This creates a bold ladies’ piece, which is complemented by a white mother-of-pearl dial and matching white alligator leather strap. The watch retains elements of its classic look, such as the luminous Arabic numerals, graduated minute track and period squelette hands with luminous material and a small seconds dial at 6 o’clock. The OMEGA Aquarella timepiece is equipped with the calibre 2200 that carries official chronometer certification from the Official Swiss Chronometer Testing Institute (COSC). It has a power reserve of 44 hours when fully wound and exhibits a fine decorative finish of Geneva wave décor, circular graining and gold-plated engravings. A screw-in case back ensures water resistance to 50 metres. The most appealing aspect of this collection is undoubtedly the large choice of colours for the 48 precious stones that adorn the inner ring of the bezel, which sits protected behind a scratch-resistant sapphire crystal. The following precious stones are available: Amethyst, Aquamarine, Black diamonds, Diamonds, Mandarin garnet, Pink tourmaline, Rubies, sapphire, Tsavorite and Yellow beryl.